We adopted Willow from PHS in March of 2014. She suffered from seizures, but we did our best to control them. 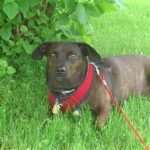 Sadly, the seizures became worse and she passed away on Tuesday May 24, 2016….